Bhubaneswar: Amity University signed a MoU with Cadila Pharmaceuticals Pvt. Ltd (CPL) – Biologicals at University Campus, Sector 125 Noida to strengthen research initiatives in the area of Life Sciences through synergetic efforts. The MoU was signed by Shri. Atin Tomar, President, Cadila Pharmaceuticals Pvt. 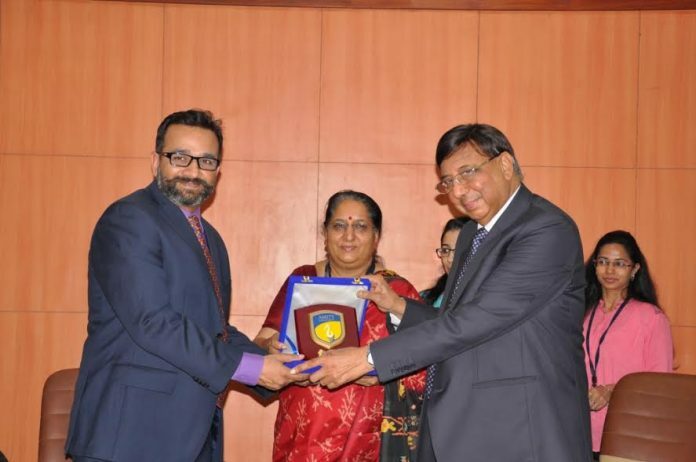 Ltd.(CPL) – Biologicals and jointly by Dr. B L Arya, Registrar, Amity University Uttar Pradesh and Dr. Chanderdeep Tandon, Director, Amity Institute of Biotechnology in the presence of Dr. Nirav Desai, Vice President and Head R&D, Cadila Pharmaceuticals Pvt. Ltd.(CPL) – Biologicals; Dr. Ashok K Chauhan, Founder President, Amity Group; Dr. W. Selvamurthy, President, Amity Science Technology and Innovation Foundation and Prof. (Dr.) Balvinder Shukla, Vice Chancellor, AUUP. Expressing his joy and pride over the MoU signed, Dr. Ashok K Chauhan- Founder President, Amity Group stressed that the scientists and researchers of Amity have been doing revolutionary R&D, focusing on frugal innovations which could benefit the mankind at large. He expressed his conviction that the association between Cadila Pharmaceuticals Pvt. Ltd (CPL) and Amity will lead to historical research work and innovations through mutual sharing of resources. Addressing the gathering, Dr. Chanderdeep Tandon, Director, Amity Institute of Biotechnology highlighted that CPL Biologicals Pvt. Ltd. is a joint-venture biotechnology company established in 2009 by Novavax Inc., USA and Cadila Pharmaceuticals Limited and shared that CPL Biologicals has become the first company to indigenously develop world’s first virus like particle (VLP) vaccine for seasonal influenza. Stressing on the collaboration, Dr. Taandon stressed that MoU aims at bridging the gap between industry and academia by preparing students as per the requirements of the industry. He shared that MoU includes joint R&D projects, Students placement and training and Joint Phd. Programmes. Giving a Presentation on CPL-Biologicals, Shri Atin Tomar, President, CPL-Biologicals outlined the innovative products developed by CPL-Biologicals since 2009 and the current research projects being carried in CPL Biologicals. He invited the students and faculty members of Amity Institute of Biotechnology at CPL for undertaking joint R&D projects which will be mutually rewarding for both the Institutions to improve the quality of research in the area of life sciences. Also present during the occasion were Directors, HoIs /HoDs, Researchers and Scientists of Amity University.